In a recent survey conducted across Western Europe, IDC Manufacturing Insights found that Western European manufacturers are realizing the importance of cloud architectures to create more business agility, improve service level, and share information with trading partners. Traditionally, the manufacturing industry has been quite skeptical when it comes to adopting cloud technology, but manufacturers are now realizing that cloud architectures can become the integration backbone to greater collaboration among trading partners operating along the same value chain, improving decision-making capabilities. The survey reveals that the drivers of cloud adoption for Western European manufacturers include "encouraging standard IT systems," "ease of deployment for end users," "improving service level to business," and "sharing information with business partners." These four drivers define the long-term cloud strategy of Western European manufacturers - to enable stronger business alignment through IT standardization. - Almost 60% of manufacturers in Western Europe have some budget specifically assigned to cloud computing. In the next three years, no company expects to reduce its cloud spending and more than half of companies will spend more. - Western European manufacturers are taking a cautious approach by gradually becoming more open to having at least some of their sensitive business processes and information running on the cloud. - There are still concerns about cloud technology, with security and availability the most prominent. - Collaboration applications and customer relationship management (CRM) are the enterprise applications where manufacturers are investing the most. - For line-of-business (LOB) applications, cloud adoption and investment are higher for solutions supporting inter-enterprise processes such as supply chain (sales and operations planning [S&OP], business to business [B2B]/electronic data interchange [EDI], and supply chain planning [SCP]) and product life-cycle management (PLM). Pierfrancesco Manenti, head of IDC Manufacturing Insights, EMEA, said, "Manufacturers today are struggling to compete in complex and hypercompetitive global markets, but leading manufacturers are those that see IT as a competitive differentiator, have created IT organizations that understand business needs, and pragmatically invest with business acumen. Cloud computing will have a considerable impact on IT performance for those firms that take a well-considered approach to investment in the model. Concerns still exist, with security and availability the most prominent, but these usual concerns are rapidly being overcome by massive benefits, thus driving adoption." The survey results are analyzed in a new report, Manufacturing and Cloud Computing: A View From Western Europe (IDC Manufacturing Insights #MIVC04U, March 2012), which highlights the nature of the current cloud environment in manufacturing, future plans for cloud deployments, and cloud investment drivers and inhibitors. 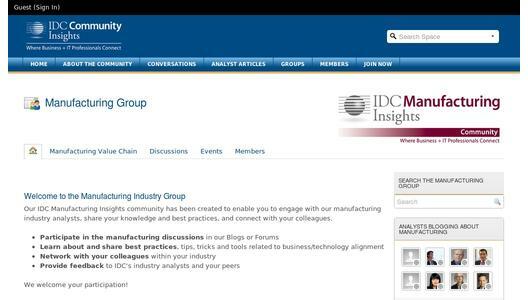 The report highlights IDC Manufacturing Insights' top recommendations and actions to consider for CIOs, key IT decision makers, and IT professionals in manufacturing. For more information about the report or to arrange a one-on-one briefing with IDC Manufacturing Insights analysts, please contact Kanupriya at kanupriya@idc.com.